Paul A. Meunier was a Cleveland area artist who enjoyed painted nature and wildlife. He worked on staff as an artist at Schmitz-Horning Company, a wallpaper manufacturing firm, in the 1920s and 1930s. Of interest to me because of my family ties to the company, I published a list o known artists that were employed there. A couple people contacted me regarding their Paul Meunier artwork. The other individual purchased a map that Paul Meunier’s created of his family vacation travels from Ohio through parts of the western U.S. (1939). The contact wrote me stated that the lithograph was purchased at a Bay area market. It’s interesting to see the broad range of work and depth of this artist, and even more interesting to speak to others who have his art work. Etched or engraved plastic art panels by Paul Meunier, 1970, owned by Charlie Grenier. Panel size is approximately 3×4 to 5×7 inches. Name and 1970 date on art panels by Paul Meunier. Map created by Paul Meunier of his family trip across the country, owned by Peter Bartels. Old House Journal article includes Schmitz-Horning Co.
Old House Journal, May 2018, cover. Schmitz-Horning Company was included in an article on scenic wallpapers in established old house restoration magazine, Old House Journal magazine, May 2018 issue. The tasteful article, by Brian E. Coleman, displays a variety of high end wall coverings including hand painted paper. Schmitz-Horning’s San-kro-mura™ line is mentioned, which stood for sanitary or washable, color, chromolithograph mural. Images of the Villa Medici wallpaper pattern and 1917 catalog page for The Lombardy appear. The Schmitz-Horning Company patented the printed frieze for walls in 1906 (https://patents.google.com/patent/US830931). Old House Journal magazine, May 2018 issue, scenic wallpapers article, page 29. Printed frieze for walls patented by Schmitz-Horning Co.
Schmitz-Horning Co. The Lombardy wallpaper pattern, from the 1917 catalog. Schmitz-Horning’s Villa Medici scenic mural, San-Kro-Mura line. Karl Germain the Wizard Magic Posters Printed by Schmitz-Horning Co. In 1908, Schmitz-Horning Company (est. 1905), a Cleveland, Ohio lithographic printing company, manufactured a series of large color lithographic advertising posters for professional magician Karl Germain. Additionally printed was a brochure. Karl Germain (Charles Mattmuller), 1878-1959, was a native of Cleveland, and performed unique magic of his own creation in both America and England until his stage career ended prematurely in 1916 due to blindness. These posters, and those of other magicians, have become highly collectible in ‘magicana’ collections (antiques and collectibles related to magic and magicians). Several international auction houses (and eBay) have offered these rare magic lithographs, and other wall murals by the Schmitz-Horning Company, for sale since around 2010. Potter & Potter Auctions of Chicago, Illinois has auctioned dozens of Schmitz-Horning Co. Karl Germain magic posters. Recently, one of the Karl Germain’s magic posters became available in Google Arts & Culture for the public to enjoy and learn about. Schmitz-Horning was known for their early large scale capacity printing presses. At the time they owned two of three such custom-built presses in the world, and the 40″ x 80″-plus plates were shipped-in from Germany. William Horning, was a partner of the Schmitz-Horning Company, a lithographic wall covering and mural manufacturing firm in Cleveland, Ohio founded around 1905. His name appeared on a 1906 patent for a printed repeat pattern wall frieze (US 830931 A), along with that of Hugo Max Schmitz I (my great-grandfather), and Warren R. Cox (family friend and head salesman). William (Bill) Horning was a Cleveland area artist and lithographer, in addition to Hugo. He sold his interest in Schmitz-Horning around 1920, but continued to work in the printing industry in the Cleveland area. He was referred to as a landscape, marine, and animal painter of Cleveland (Cuyahoga area), and exhibited with the Cleveland Art Club and the Water Color Society of Cleveland starting in 1894. He led and evening sketch class at the Cleveland Art Club in 1895. That is around the time that my great grandfather Hugo M. Schmitz, who moved to Cleveland from Wisconsin, attended the group. They may have met there before starting Schmitz-Horning Co. not long thereafter. In 1930 he participated in an exhibition of water colors by members of the Cleveland Society of Artists, a group who held member exhibits semi-annually. Carl Broemel, who created art for many murals for Schmitz-Horning, also had paintings in the exhibit, and incidentally was hired by my grandparents to paint an oil portrait of my mother as a young girl. The floral oil painting by William Horning shown sold from the Baldwin-Wallace College collection at Rachel Davis Fine Arts auction in 2009. Copyright article. All rights reserved. Not to be used without permission. CleDPL library assistant Ray Rozman scans an original Schmitz-Horning Co. wall mural design. In going through the family house a few years ago, I discovered catalogs and samples from my great-grandfather’s former Cleveland-based business, the Schmitz-Horning Company. Since then, I have been researching and learning about the company, and our family’s role in the company. The Schmitz-Horning Company, which specialized in high quality washable color wallpaper, artistic murals and scenic panoramic wall coverings, was founded around 1905 by Hugo M. Schmitz I, an artist and my great-grandfather, and William (Bill) Horning, a lithographer. Mr. Horning left the partnership around 1920. My grandfather (Hugo’s son), Warren R. Schmitz, acted as vice president of the company starting in the late 1920s. After the tragic automobile-related death of Hugo Schmitz in 1938, Warren Schmitz served as president of the company. Through Google, Cleveland’s newspaper The Plain Dealer archives through the Cuyahoga County Public Library’s website, and family materials, I have started my journey of piecing together a historical footprint of the company and some of the people that worked at the company. 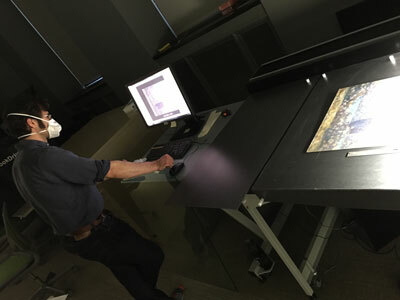 CPL Map/GIS librarian Tom Edwards scans a Schmitz-Horning scenic wallpaper design. Recently, I discovered the public resources available at Cleveland Public Library in downtown Cleveland. Over several trips there, I visited the Cleveland Digital Public Library (CleDPL) (under the direction of Chatham Ewing, Digital Library Strategist), at 325 Superior Avenue, 3rd floor, the map department and the history department at 525 Superior Avenue, 6th floor, the business department on the 2nd floor, and the photograph collection on the 4th floor, and as a patron received assistance in researching and in documentation of our family’s materials. Additionally, I was made aware of the Cleveland Public Library Digital Gallery, the library’s public online digital gallery. 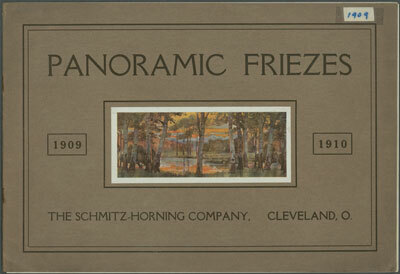 Panoramic Friezes catalog, 1909-1910, the Schmitz-Horning Company, Cleveland, Ohio. A dedicated library staff assisted and enabled me to do extensive high resolution and large-scale scanning of our deteriorating Schmitz-Horning original wallpaper designs and mural lithographs, and multiple company catalogs, with an early one dating back to 1909, and most being the only known catalogs in existence. The Cleveland Digital Public Library, a new department since spring of this year, accommodated me for many hours spread over several weeks by assisting me with scans on an i2s SupraScan Quartz overhead scanner, synced to a pc, with size capabilities up to 33″ x 46″. They suggested methods regarding the preservation and storing of the materials. 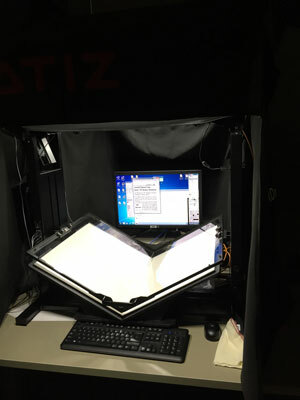 Other equipment available included an Epson Expression 10000 XL for photographs, and several book scanners, one high-speed ATIZ scanner, and one a versatile and user-friendly Knowledge Imaging Center (KIC) scanner. 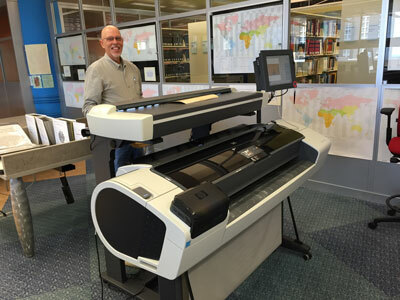 The map department had a large-scale feed-through type scanner (plus printer), a Hewlett Packer Designjet T1200 HD MFP, which scans up to 41″ wide by any length, which enabled me to scan one-of-a-kind lithographic wallpaper rolls, some over 100 inches long. A selection of the materials scanned will be available on the Cleveland Public Library Digital Gallery, making documentation on this historic Cleveland business available to the public. Individuals researching companies in the wallpaper industry may also find it useful. 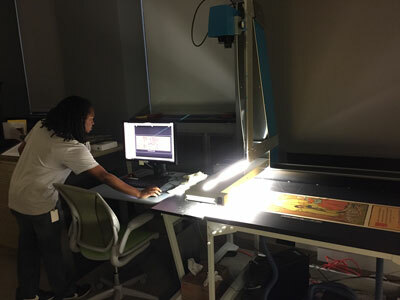 Curtis Flowers scans a Schmitz-Horning Co. lithograph on CleDPL’s large overhead scanner. 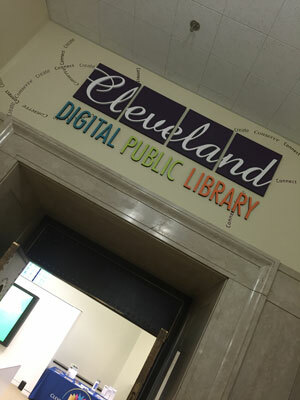 The Cleveland Digital Public Library (CleDPL) department of Cleveland Public Library. Book Scanner at Cleveland Digital Public Library.